The page "Problems on Volume". On this page we are going to see a practice problem on volume for some particular solids. To understand this topic much better you can go through the following questions. Mr.David has a toy in the form of hemisphere with a cone surmounted on it and is having the radius 3.5cm.The total height of the toy is 15.5cm.He would like to find the volume of the toy.Please help him to find the volume of the toy. 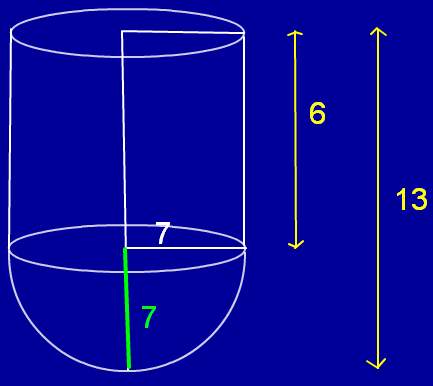 A vessel is in the form of hollow cylinder which has been surmounted on a hemispherical bowl.The radius of the hemisphere is 7cm and the total height of the vessel is 13cm.Determine the total capacity of the vessel. Student who are practicing problems on volume can go through the steps of the above problems to have better understanding.